If you are new in Spain or you are just visiting and you have never been to the capital of Spain, you just must dedicate at least one weekend for it. 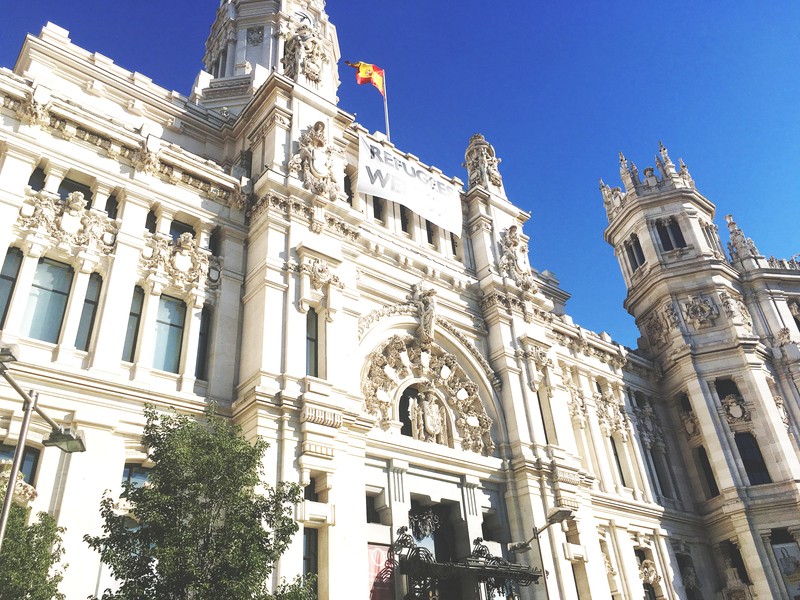 In this blog post, we are providing the one-weekend plan which will allow you to get to know Madrid and to have an amazing time. If you arrive at Madrid by train then your are actually in the first place which you have to visit! Yes, Madrid Atocha railway station has an amazing looking Interior plaza where you might start feeling like you are in the middle of the jungle. You will find palm trees other tropical plants, as well as the pond where a crazy amount of turtles are swimming and enjoying the sun. Those little turtles are a real joy and perfect entertainment especially if you are waiting for your train or someone to come to pick you up. When you had enough of the turtle show, and you are leaving from the train station don’t miss the huge baby face made out of the stone. You just must take some funny photo next to it! Continue getting to know Madrid walking along the street called Paseo del Prado. On the way, we would highly recommend visiting Museo del Prado which during certain hours is free of charge! It is one of the biggest Spain’s art galleries and indeed one of the most popular across the country. If you continue walking along the same street from the train station and passing the Museo on the right side you will see Sculpture of Goya build to honor one of the best painters of Spain. From there your next view spot, the Neptune Fountain which is in the Square called Plaza Cánovas del Castillo should be very well visible. Take some photos and head straight from there to Apollo Fountain which is also known as the four seasons fountain. This fountain might be not so famous like the Neptune or Cybeles which you will see just in the few minutes, however, it is definitely worth to capture. The Cybele Fountain and Cybele castle are at the very end of the Paseo del Prado and they are one of the biggest attractions of Madrid. After a long day, we would suggest to finish it in one very well rated restaurant which is just in front of another big attraction of Madrid in the area of so-called Barrio de Salamanca. Have a nice dinner in the restaurant Arahy next to the Puerta de Alcala. The place is very famous for its seafood especially tuna and very delicious starters as well as desserts. The best part of the restaurant is that it has a prefixed price for starters and the main course will cost you € 29,50 and you will have a huge variety of options to choose from. Start your Saturday by walking along Calle de Alcala towards the Gran Via. See the impressive building such as Banco de España (Spanish Bank), Círculo de Bellas Artes, Metropolis, Church of San Jose. If you haven’t eaten yet then stop at the Mercado de la Reina, order yourself tostada with tomato (toast with tomatoes) and a cafe con leche (coffee with milk) and enjoy it. It will cost you only €2,50 and it will be freshly made and super tasty. Be aware that this place is always super busy so come before noon to get a spot! When your stomachs are happy and full, continue walking along Gran Via. On the left side, you will see Plaza del Callao which is one of the best areas to shop and where the first shop of the commercial center El Corte Ingles was opened. Keep walking until Plaza de España where the huge monument of Cervantes is placed. Take some pictures and cross Calle de Bailén and enter into the Parque del Oeste where you must see the temple Templo de Debod (Temple of de Debod). Also, do not miss the opportunity to see the Fountain of Juan de Villanueva as well as cedar tree named “El Abuelo” – the grandfather – one of the oldest and biggest trees. In addition to this behind the temple, there is an amazing view point of the Royal Palace. Head down Calle de Bailén towards Royal Palace by stopping to take some photos in the Jardines de Sabatini (Sabatini Gardens). The view there is just stunning! Enter into the palace and learn about Royal Family and Spain in general. Next attraction of yours is Archbishop of Madrid and Catedral de la Almudena where the Royal family of Spain got married. Here you also will have an opportunity to visit the Almudena, Madrid Sants, Neo-Romanesque Crypt. Unfortunately after so much walking there is no time to rest. Hopefully, your breakfast was really good and made you full for a long time. After visiting Cathedral of Almudena take Calle Mayor and head towards Plaza Mayor. We are sure that the Madrid’s main square together with Casa de la Panadería which is on the north side of the Plaza Mayor will definitely impress you. After finally filling your bellies with a tasty national food, walk to Puerta del Sol (Sun door), one of the busiest main squares in Madrid. Don’t miss the sign of The Origen of kilometers zero which can be found at the same square at the entrance of the House of the Post Office. Start final stage of your Saturday in Madrid by walking back to the Acala street. On the way take a photo of Statue of the bear and the strawberry tree (El Oso y el Madroño) which represents The Coat of arms of Madrid. Enjoy the views of the Alcala street while heading towards the Cibeles fountain. If you still have some energy and it is not super late we would truly recommend to stop at Azotea del Círculo de Bellas Artes and enjoy amazing views of Madrid from the terrace. After intense Saturday, it might be that you would like to sleep a little bit longer and have a more relaxed start of the day. There are a lot of breakfast places in Madrid however, I would recommend heading to Sucre Tearoom especially if you are a tea person. Grab one out of many teas, some sandwich, Crossan or any other available breakfast option and enjoy your relaxation moment and unique decorations of the cafeteria surrounding you. Continue your semi lazy Sunday by heading to the Retiro Park of the Madrid (Parque de el Retiro) which is just a few steps from the cafeteria. Discover the park. Don’t miss Monumento Alfonso XII and possibility to rent a little boat at the pond which is just in front of the monument. While you are here you must visit Palacio de Velázquez and Palacio de Cristal which are very close to each other. Also, Casita del Pescador, Monumento a Martínez Campos, Fuente de las Esfinges, Estatua del Ángel Caído, Fuente de los Galápagos are also worth to see. If you still have some time left after walking around the Retiro Park, don’t miss an opportunity to visit Centro de Arte Reina Sofía which is just a few steps from the train Station of Madrid. P.S. if you are lucky you might get a free entrance and enjoy this amazing museum without spending any money. When time to leave Madrid comes don’t waste your energy and time on a sad mood. Better, remember all the impressive places wich you visited, the taste of the food, and discoveries which you made. We are sure you will be more than eager to come back soon! Previous Spanish Meals you Must Try!